Yotam Ottolenghi and Sami Tamimi are the men behind the 2011 runaway bestseller Plenty, which broke boundaries bringing inventive vegetarian cookery to a much wider audience. They followed up in 2012 by turning their attention to their shared home city: Jerusalem. Both Yotam and Sami were born there in the same year, Sami on the Arab east side and Yotam in the Jewish west. Nearly 30 years later they met in London, and discovered they shared a language, a history, and a love of great food. 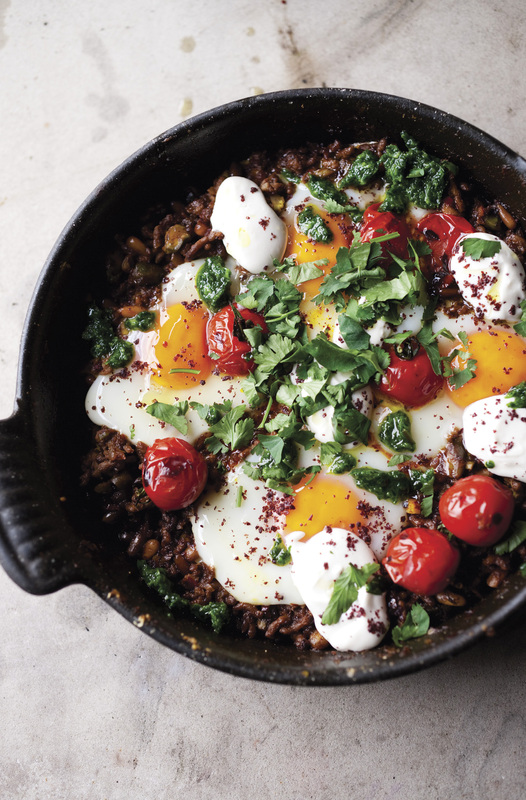 Jerusalem: A Cookbook sets 120 of Yotam and Sami’s creative, accessible recipes within the cultural and religious melting pot of this diverse city. With culinary influences coming from its Arab, Jewish, Christian and various sub-communities, and with a Mediterranean climate, the range of ingredients and styles is stunning. From soups (spicy freekeh soup with meatballs), pulse and grain dishes (saffron rice with barberries, pistachio and mixed herbs), meat and fish (roast chicken with clementines and arak, pan-fried sea bream with harissa and rose), vegetables and salads (spicy beetroot, leek and walnut salad), savory pastries (herb pie), to cakes and desserts (clementine and almond syrup cake), every reader will discover something new and inspiring within its pages. 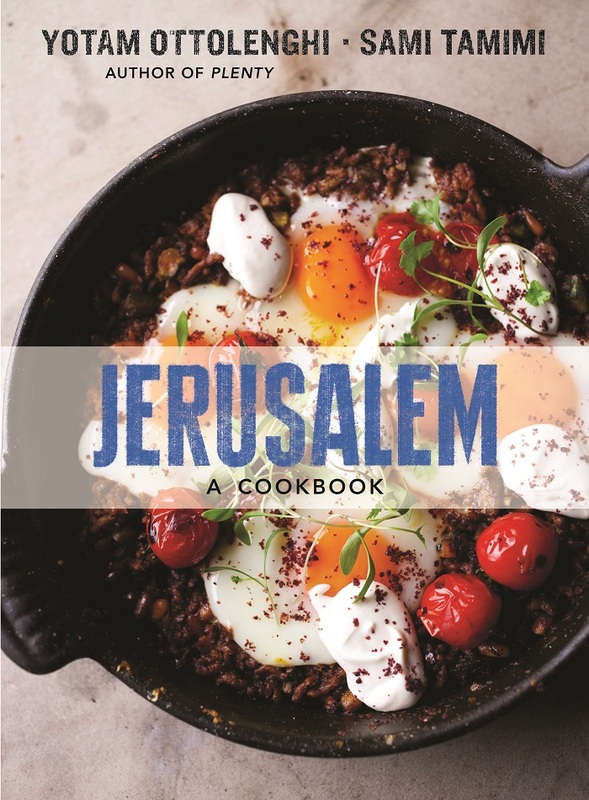 Packed with beautiful food and gorgeous photography by Jonathan Lovekin, Jerusalem showcases sumptuous Ottolenghi dishes in a dazzling setting. A full introduction from Yotam and Sami explores their complex relationship with their home city, its ethnic makeup, and the way in which its inhabitants interact with food. Pieces of writing interspersed throughout the recipes explore key themes and dishes in more detail, from kibbeh to baba ghanoush, couscous and, of course, hummus. More than a cookbook, Jerusalem encompasses history, politics, geography and much more—a unique snapshot of this remarkable city. Needless to say, Jerusalem met with resounding success. Bon Appétit wrote: “These vibrant recipes are spice-heavy, vegetable-forward, and consistently delicious.” The Wall Street Journal concurred: “Creative, splendidly illustrated recipes that you are unlikely to find in any other single cookbook—or any other single city—in the world.” EatDrinkFilms is grateful that TenSpeed was willing to let us profile one of their older titles for our Jewish-themed issue, but want to make sure to advise that, after Jerusalem: A Cookbook , Yotam Ottolenghi and Sami Tamimi collaborated yet again on Ottolenghi: The Cookbook and Plenty More by Yotam Ottolenghi will be published in October 2014, all through TenSpeed Press. Reprinted with permission from Jerusalem: A Cookbook by Yotam Ottolenghi and Sami Tamimi, copyright © 2012. Published by Ten Speed Press, an imprint of Random House LLC. Food Photography credit: Jonathan Lovekin © 2012. All rights reserved. Support your local bookstore or purchase the book through our affiliate links at IndieBound or Amazon. Put the first six ingredients in a large mixing bowl and add 2½ teaspoonssalt and 1½ teaspoons black pepper. Whisk well and set aside. Trim the fennel and cut each bulb in half lengthwise. Cut each half into 4wedges. Add the fennel to the liquids, along with the chicken pieces,clementine slices, thyme, and fennel seeds. Stir well with your hands,then leave to marinate in the fridge for a few hours or overnight (skipping the marinating stage is also fine, if you are pressed for time). Preheat the oven to 475°F / 220°C. Transfer the chicken and its marinade to a baking sheet large enough to accommodate everything comfortably in a single layer (roughly a 12 by 14½-inch / 30 by 37cmpan); the chicken skin should be facing up. Once the oven is hot enough,put the pan in the oven and roast for 35 to 45 minutes, until the chicken iscolored and cooked through. Remove from the oven. 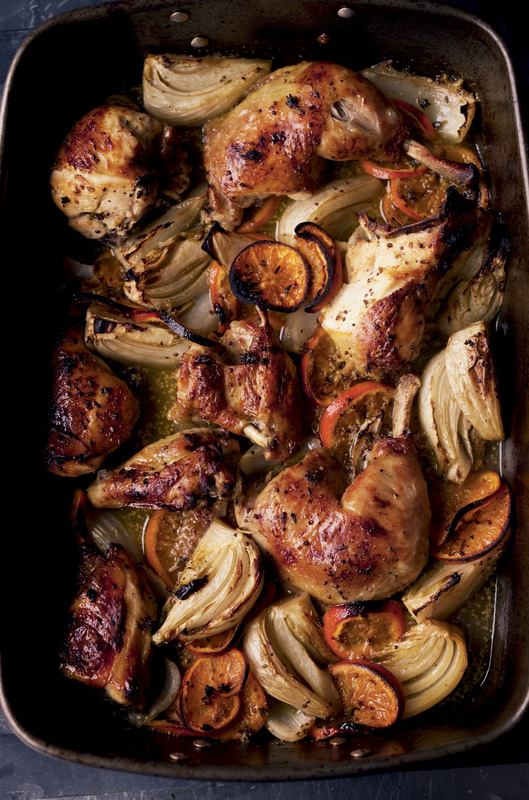 Lift the chicken, fennel, and clementines from the pan and arrange on aserving plate; cover and keep warm. Pour the cooking liquid into a small saucepan, place over medium-high heat, bring to a boil, and then simmer until the sauce is reduced by one-third, so you are left with about cup / 80 ml. Pour the hot sauce over the chicken, garnish with some parsley, and serve. Heat the olive oil over medium-high heat in a medium, heavy-bottomed frying pan for which you have a tight-fitting lid. Add the onion and garlic and sauté for 6 minutes to soften and color a bit. Raise the heat to high, add the lamb, and brown well, 5 to 6 minutes. Season with the sumac, cumin, ¾ teaspoon salt, and some black pepper and cook for another minute. Turn off the heat, stir in the nuts, harissa, and preserved lemon and set aside. While the onion is cooking, heat a separate small cast-iron or other heavy pan over high heat. Once piping hot, add the cherry tomatoes and char for 4 to 6 minutes, tossing them in the pan occasionally, until slightly blackened on the outside. Set aside. Prepare the yogurt sauce by whisking together all the ingredients with a pinch of salt. It needs to be thick and rich, but you may need to add a splash of water if it is stiff. You can leave the meat, tomatoes, and sauce at this stage for up to an hour. When you are ready to serve, reheat the meat, add the chicken stock, and bring to a boil. Make 4 small wells in the mix and break an egg into each well. Cover the pan and cook the eggs over low heat for 3 minutes. Place the tomatoes on top, avoiding the yolks, cover again, and cook for 5 minutes, until the egg whites are cooked but the yolks are still runny. Remove from the heat and dot with dollops of the yogurt sauce, sprinkle with sumac, and finish with the cilantro. Serve at once. Figs are abundant in Jerusalem and many trees, bearing the most delectable fruit, actually belong to no one, so anybody can help themselves. Summer months are always tinted with the smell of wild herbs and ripe figs. The mother of Sami’s childhood neighbor and friend, Jabbar, used her roof to dry the glut of figs (and tomatoes) in the hot summer sun, spending hours cleaning and sorting them meticulously. Poor Um Jabbar—Sami and her son never wasted time and used to sneak up to her roof regularly, stealing her figs at their peak and causing havoc. This wasn’t enough for Jabbar, though. The boy had such a sweet tooth that he always carried around with him an old match box full of sugar cubes, just in case. Unfortunately, this habit had clear ramifications, evident in his “charming” smile. This unusual combination of fresh fruit and roasted vegetables is one of the most popular of Ottolenghi. It wholly depends, though, on the figs being sweet, moist, and perfectly ripe. Go for plump fruit with an irregular shape and a slightly split bottom. Pressing against the skin should result in some resistance but not much. Try to smell the sweetness. The balsamic reduction is very effective here, both for the look and for rounding up the flavors. To save you from making it, you can look for products such as balsamic cream or glaze. Preheat the oven to 475º / 240º C.
To make the balsamic reduction, place the balsamic vinegar and sugar in a small saucepan. Bring to a boil, then decrease the heat and simmer for 2 to 4 minutes, until it thickens. Be sure to remove the pan from the heat when the vinegar is still runnier than honey; it will continue to thicken as it cools. Stir in a drop of water before serving if it becomes too thick to drizzle. 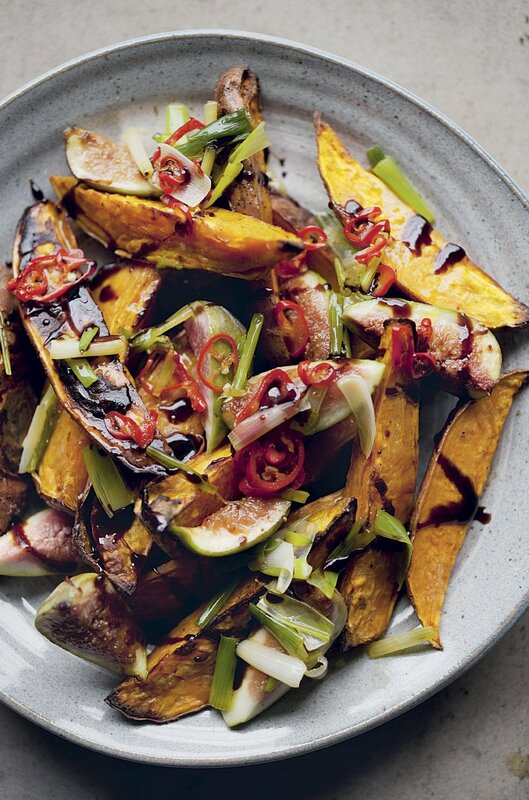 Arrange the sweet potatoes on a serving platter. Heat the remaining oil in a medium saucepan over medium heat and add the green onions and chile. Fry for 4 to 5 minutes, stirring often to make sure not to burn the chile. Spoon the oil, onions and chile over the sweet potatoes. Dot the figs among the wedges and then drizzle over the balsamic reduction. Serve at room temperature. Crumble the cheese over the top, if using. Yotam Ottolenghi owns an eponymous group of four restaurants, plus the high-end restaurant, Nopi, in London. His cookbooks—Plenty, Jerusalem, and Ottolenghi—have all been on the New York Times bestseller list. This entry was posted in Eat and tagged Arabic, cookbook, Eat, Israeli, Ottolenghi, recipe. Bookmark the permalink. After Mary and Vincent Price’s “A Treasury of Great Recipes” this is my favourite cookbook! Yum yum. Ah, coming from YOU, that’s a great recommendation!! Thanks, Jenny!